Enjoy getting Nearer to Nature on a hike through fields, forests, and wetlands. Wear proper footwear with good traction. Mosquitoes, blackflies, and ticks love the forest too! Be prepared with protective clothing or insect repellent. Tread lightly and have fun! An ecotone is the "edge" where two different natural communities meet. Examples of ecotone areas include the shore where a lake and forest meet, the edge between a marsh and field, and the area between a thicket and pasture. The Ecotone Trail is a 1/3-mile hike, which will take you about one-half hour. It follows the boundary between field and forest with excellent habitat for numerous animals with abundant food and shelter. The Forest Trail is a 2/3-mile, which will take you about an hour, through “A Forest for Everyone.” A self-guiding trail map is available at Admissions. Use the Interpretation Guide to spot evidence of past and present human use of the forest and wildlife signs, and also learn ways forests can be managed for both wood and wildlife. The Mt. 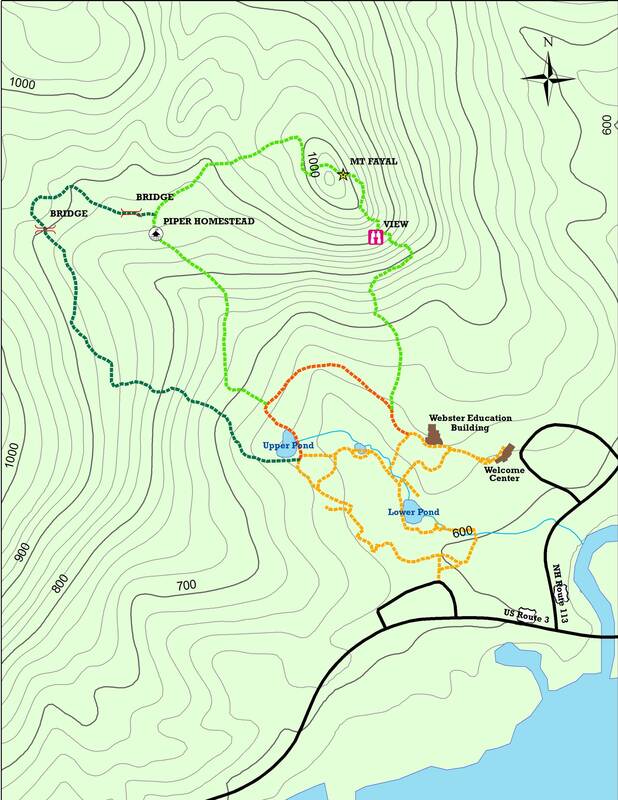 Fayal Trail is a one-mile hike, which will take you about an hour. Mt. Fayal, elevation 1,067 feet, offers beautiful views of Squam Lake. You may catch a glimpse of some truly wild creatures or interesting plants and trees. You will also be able to find signs of past human activity, such as the remnants of the old Piper Homestead. This homestead includes the ruins of stone foundations of both the farmhouse and barn, and the stone walls outlining former sheep pastures. You will also walk along what once was the carriage road leading to the Piper Homestead.